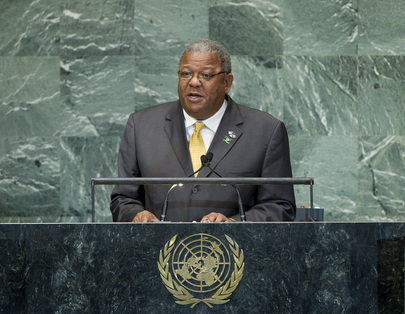 WINSTON BALDWIN SPENCER, Prime Minister of Antigua and Barbuda, recalled that the world had celebrated the International Year for Peoples of African Descent in 2011. That year had passed, and so, too, had gone from the international agenda the issue of reparations for slavery, which was central to fighting racism and racial discrimination, and nurturing a culture of peace among nations. “The legacy of racial violence, segregation and slavery against peoples of African descent has severely impaired our advancement as nations, communities and individuals across the political, social and, most importantly, the economic spectra,” he said. In the words of Ghana’s independence leader Kwame Nkrumah, he added: “We can no longer afford the luxury of delay,” reiterating a call made last year for former slave-holding States to begin the reconciliation process by issuing formal apologies for the crimes committed over the 400 years of the African slave trade. Turning to transnational crime, which was threatening in his country, he said that its size and lack of human or financial resources made it difficult for Antigua and Barbuda to address that impediment effectively. The crime and violence fuelled by the illicit trade in small arms and light weapons was jeopardizing industries such as tourism, while health-care systems were weighed down and families were being torn apart. Crime prevention and small arms control was, therefore, a priority. It was important to note that neither Antigua and Barbuda nor other Caribbean Community (CARICOM) nations manufactured arms, yet one estimate indicated that there were some 1.6 million illegal firearms in the region. Similarly, the dangers posed by non-State actors acquiring weapons of mass destruction was real, and should be seen by all countries, large and small, as the single most destructive element to international peace and security, he continued. Antigua and Barbuda was particularly concerned about lack of progress in the area of disarmament and non-proliferation. “There should be no compromise on this issue,” he stressed, calling once again for a world free of nuclear weapons. Concerning climate change, he said that during the recently concluded Summit of the Alliance of Small Island States, his country had joined others in sending the strongest message yet to the international community on the need for bold and ambitious action. “We cannot wait for our lands to disappear before we act,” he emphasized. “We must act now to respond to the climate crisis, and ensure that not a single country is sacrificed, no matter how small.” Indeed, the threat was real, he said, citing rising sea levels, coral bleaching, as well as increasingly frequent and severe hurricanes. The United Nations Framework Convention on Climate Change must take concrete steps to protect small islands and other exposed countries from the threat of climate change, he said, joining other Alliance of Small Island States member States in calling upon the Assembly to designate 2014 as the International Year of Small Island Developing States in order to raise awareness of their special situation and mobilize international support for their sustainable development. Emphasizing that economic prosperity should be shared equally among and within countries, he said the “exclusive clubs” of the G-8 and the G-20 could not repair the fragmented international financial system without duly considering the majority of nations “left on the outside with much to offer”. Antigua and Barbuda called on the developed world and the Organization for Economic Cooperation and Development (OECD) countries to guarantee that their approach to international tax matters would involve improved cooperation through comprehensive and supportive frameworks that ensured the involvement and equal treatment of small jurisdictions, without such nuances of inappropriate branding as “tax havens”. Years after the World Trade Organization (WTO) had found in favour of his country in a dispute involving the gaming sector, the country was still engaged in negotiations with the United States, he noted, calling on that country quickly to resolve the matter and arrive at a fair and just settlement.